Feeding ourselves should be one of the least complicated tasks we perform during the day, yet in 2016 food has become one incredibly complicated subject. Friend, I believe real food is the answer that our nutritionally-void-grab-at-any-health-fad culture desperately needs. We need to return to the days when food was simple, when food came from the ground or the animal that walked the ground. Food that was then prepared in home kitchens with lots of love and patience, or purchased from a well-trusted source. That’s the kind of real food I’m referring to. Health fads come and go, but real food transcends generations. 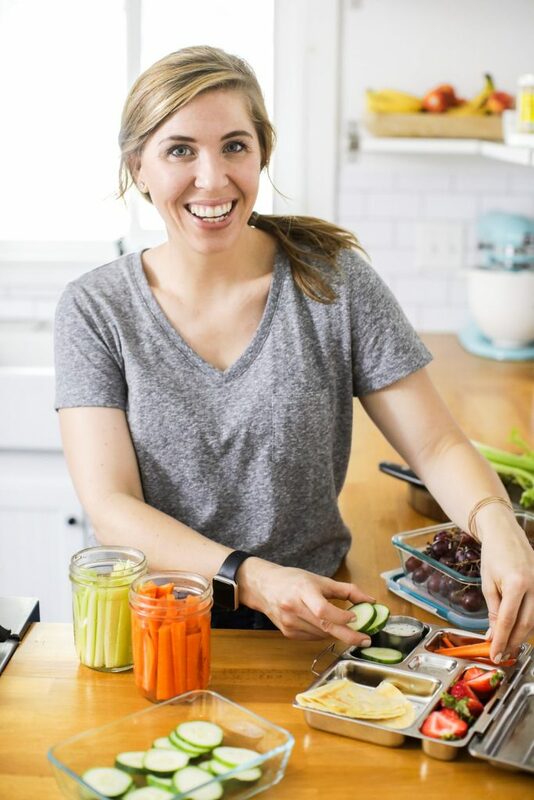 Since I believe so much in getting back to real food, and I know you believe in that, too, we spend a lot of our time together cooking and making meals, along with diving deeper into the age-old food wisdom of Great-Grandma. Last year, we talked about real food sweeteners. Last month, we talked about real food flours. Today, let’s chat about real food oils and fats. There are many different oils and fats in the average American grocery store today. Have you seen the butter section recently? There’s butter and then there’s butter with added oils, and “heart healthy” this and that. Talk about confusing! 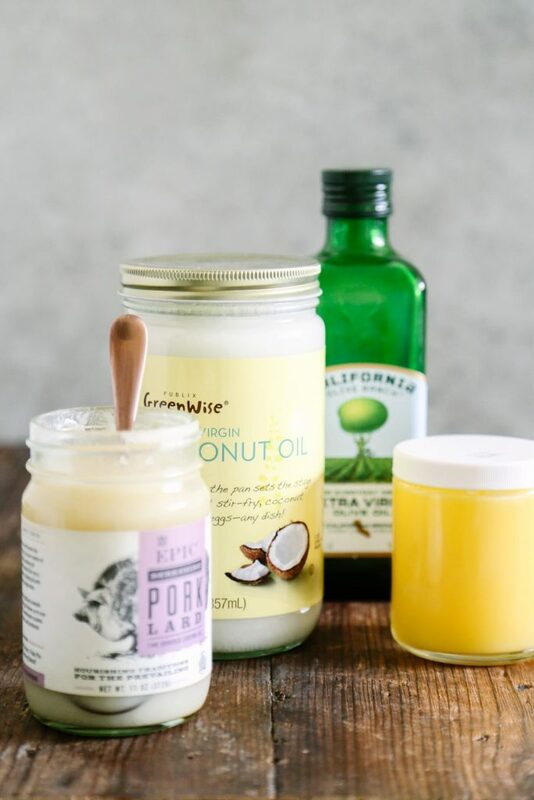 Today, I’m not going to talk about all of the oil and fat options in the grocery store; rather, I’m just going to share my top oil and fat picks. The oils and fats that I believe are the best multi-purpose real food options for cooking and baking. Just a quick note before we proceed. You’ll notice throughout our discussion that I reference the term smoke point. This term is used to help provide a reference to how to use the fat or oil. According to the lovely Wikipedia, “The smoke point indicates the temperature limit up to which that cooking oil can be used.” Keep the smoke point of an oil or fat in mind as you think about how to use it in your kitchen. 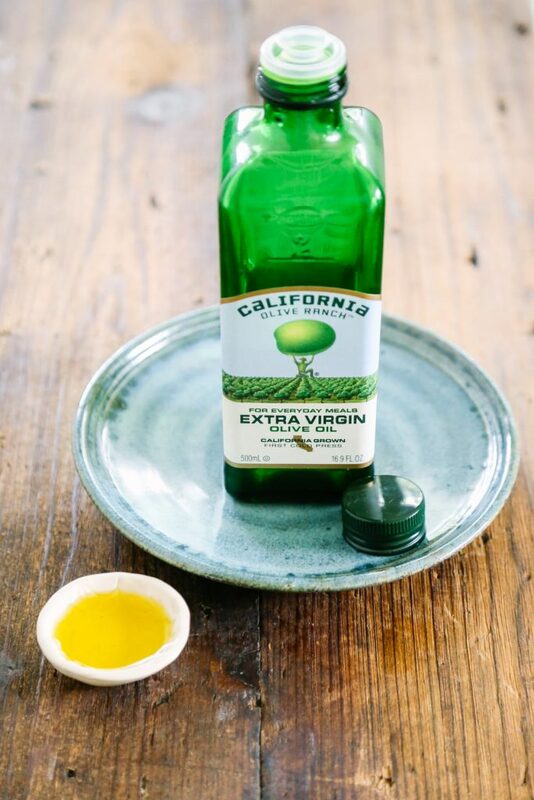 My favorite oil to use in my kitchen is extra virgin olive oil. The majority of the time I purchase my olive oil in large tins from Whole Foods, our local health food store, or Trader Joes. Olive oil is a cold-pressed oil, made from the olive tree, that’s rich in monounsaturated fatty acids. Extra virgin olive oil has a lower smoke point, 325-375F/160C, than the other oils and fats we’re going to talk about. Reaching the smoke point of olive oil is difficult unless you’re going to leave the oil in a skillet for an extended period of time (AKA: forgetting about the skillet on the stove-top…I don’t recommend that! ), or frying food. There are better alternatives for frying food, which we’ll talk about next. Olive oil is my go-to oil for salad dressings, cold dishes, and sometimes for baking. I also use olive oil in my facial cleanser. All olive oil will go rancid eventually. When properly stored and handled, olive oil should last about two years. Olive oil should be stored in a dark container, and the oil should be a golden color. I try to stick with single-origin olive oils, which means the oil should come from one country or state versus a mixture of several different countries. One of my favorite olive oil brands that can be found in just about any store in the United States is California Olive Ranch. Note: Light/refined olive oil has a high smoke point, 465F/240C, so this could be used for very high-temperature cooking. 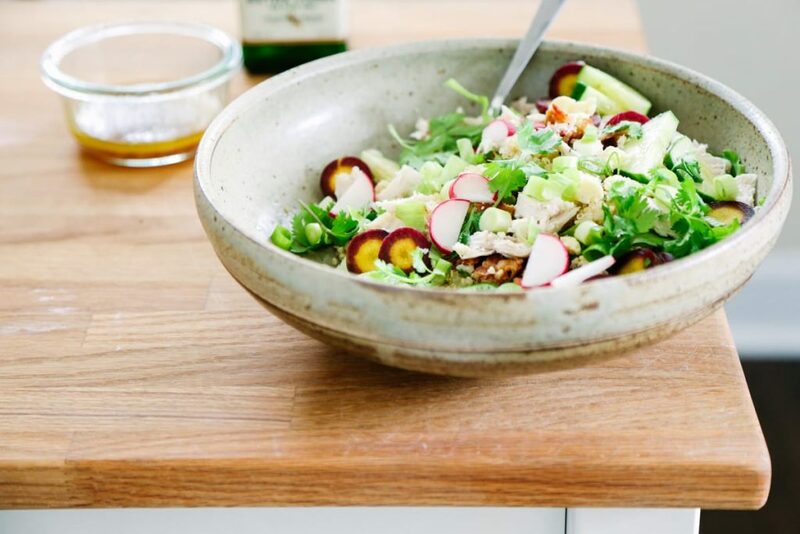 Avocado oil has been gaining popularity in the American food scene, and rightfully so. Avocado oil is pressed from the pulp of the avocado, which produces a neutral-tasting oil. Avocado oil has a high smoke point, 460F/237C, which means the oil may be used for very high temperature cooking, including frying. Avocado oil is my go-to oil for anything that I need to lightly fry: plantains, chicken nuggets, etc. I also use avocado oil to make homemade mayo since it’s light and has such a neutral flavor. When I first started using avocado oil the product was hard to find and the price was quite hefty. Costco now sells large bottles, pictured below, for about $14 (I believe). 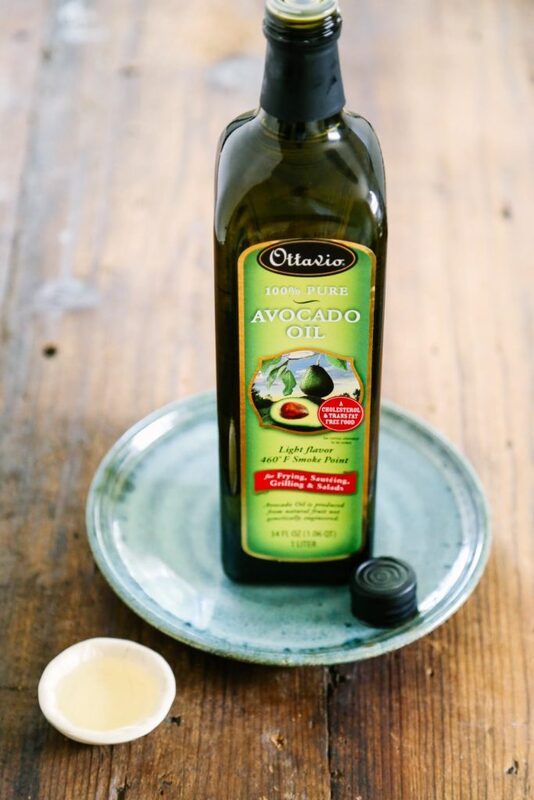 Most health food stores and online retailers, like Amazon, also sell avocado oil. Coconut oil is a very popular oil these days, so it may surprise you to hear that I don’t use coconut oil very often. In fact, the only time I use coconut oil these days is for very random baking recipes that call for this oil, and DIYs (like deodorant and shaving cream). I personally don’t care for the distinct flavor that virgin coconut oil imparts on food. If you love the taste of coconut or you need to go dairy-free, coconut oil is a great cooking and baking ingredient option. Coconut oil is extracted from the meat of the coconut. Coconut oil has a semi-high smoke point, 350F/177C, although it’s a bit lower than avocado oil. 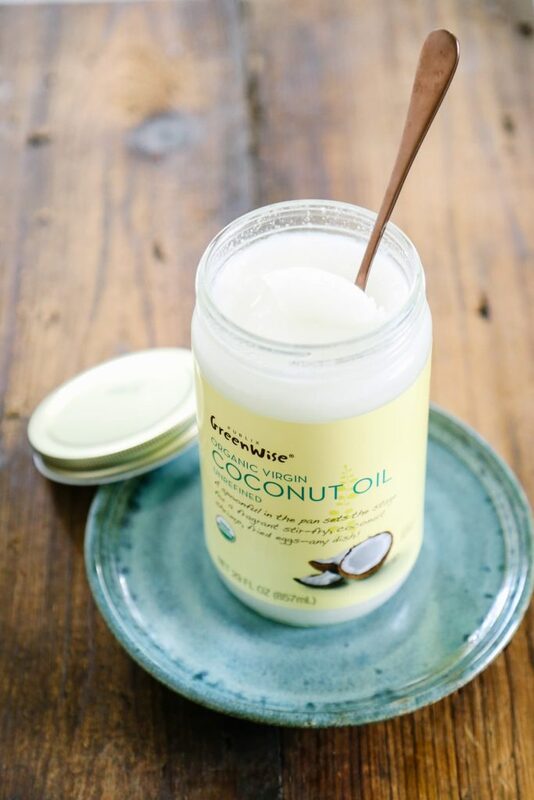 Coconut oil is solid at room temperature, and liquid when the outside environment is warm. I prefer to use virgin and unrefined coconut oil. Nutiva brand is usually my go-to, but there are many great brands now on the market. If you’ve spent any time in the recipe section of the blog, then you’re probably already aware of my deep love for butter. Butter is a fairly new food in my life, considering that the first 26 years were spent consuming that unspeakable m word (margarine, shudder). Butter is a completely natural product, which is made by simply churning (shaking or beating) cream (the natural liquid that rises to the top in a jug of unhomogenized or raw milk). The shaking and beating of the cream transforms a once liquid substance into soft butter. Real butter should not contain added oils or preservatives, other than salt. Butter is by far my favorite all-around fat to use in my kitchen. Butter adds amazing flavor and depth to dishes, from savory soups to sweet cookies. There isn’t anything butter can’t do. Well, except maybe a salad dressing. I’d even draw the line with that one. Butter has the same smoke point temperature as coconut oil, 350F/175C, so it may be used for medium-high temperature cooking, but it will burn when kept at a very high temperature for a sustained period of time. Not all butter is equal, because the quality of the butter you purchase really depends on where the cream that made the butter came from. In our modern-day age of industrial farming, cows no longer spend their time grazing the green meadows that are pictured on the signs in our grocery stores. The majority of dairy and beef in today’s market comes from cows living in giant CAFOs (Concentrated Animal Feeding Operation). Just Google CAFO and you’ll be able to scroll through pages of less-than-ideal-not-meadow-like images. What’s the big deal? Well, cows weren’t designed to eat grain, corn, by-products, and everything else they eat via the CAFO feeders. Cows, by design, are meant to enjoy grass. Yes, supplementation may occur through the winters when grass isn’t present, but grass is the main staple of the cow’s diet. Not in America. So what’s a butter and hamburger loving gal to do? The answer can be found in two little words: grass fed. When it comes to butter, or any dairy or beef, I look for grass-fed products. 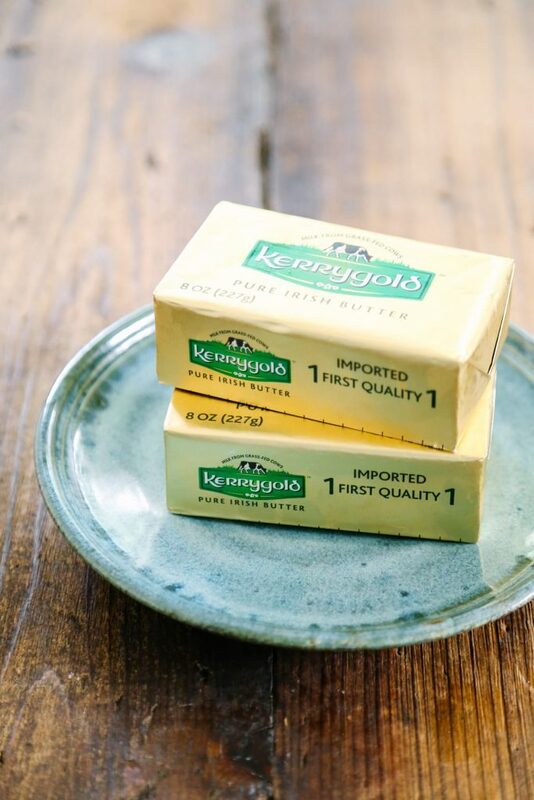 A couple of my favorite brands for butter are Kerrygold and Organic Valley. I purchase Kerrygold butter at Costco. Just when I thought butter couldn’t get any better, ghee shows up! Ghee is clarified butter. 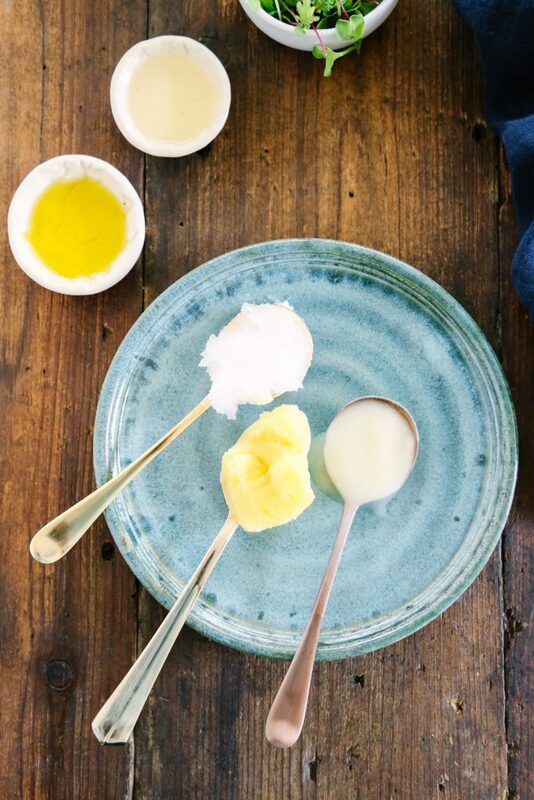 To create ghee, the milk solids are removed from butter through a heating process to create a natural butter substitute. The end result is a rich yellow, nutty-tasting, soft “butter” that doesn’t need refrigeration. Since the milk solids have been removed, many people who can’t consume dairy may be able to safely enjoy ghee. Ghee is very simple to make at home, but it does require some patience. If you’d like to make ghee at home, this tutorial will help guide you through the process. Ghee can be found in the ethnic sections of many stores. Just like butter, look for a grass-fed option. Organic Valley is my preferred brand. I keep a small jar of ghee in my pantry to enjoy mainly on toast and occasionally for cooking. Ghee has a much higher smoke point than butter, 450F/232C, so if you want a butter-like option for high-temperature cooking, this is your fat! I typically don’t use ghee for cooking or baking since we don’t have any dairy allergies, and I prefer to use less expensive butter, avocado, or olive oil. My final fat and cooking oil choice may come as a surprise since my title included the words “healthier fat.” Let’s talk about good ol’ lard. Poor lard isn’t the most respected fat choice available, and probably isn’t one that most Americans have ever tried eating or cooking with. I think the shunning of lard is the direct result of the product, Crisco, which replaced lard. Crisco was invented by a candle-maker for burning candles during the Civil War. Lard, unlike vegetable shortening or Crisco, is a natural product that’s made by heating the fat leftover from a slaughtered pig (yes, graphic, but true). The resulting fat is strained and then used for cooking and baking. Lard may be added to pie crusts or biscuits, or used to fry food. The smoke point of lard is around 400F/204C. I personally don’t care for the wild odor and taste of lard, but if you can tolerate it, this fat is a good real food option to stock in your pantry. 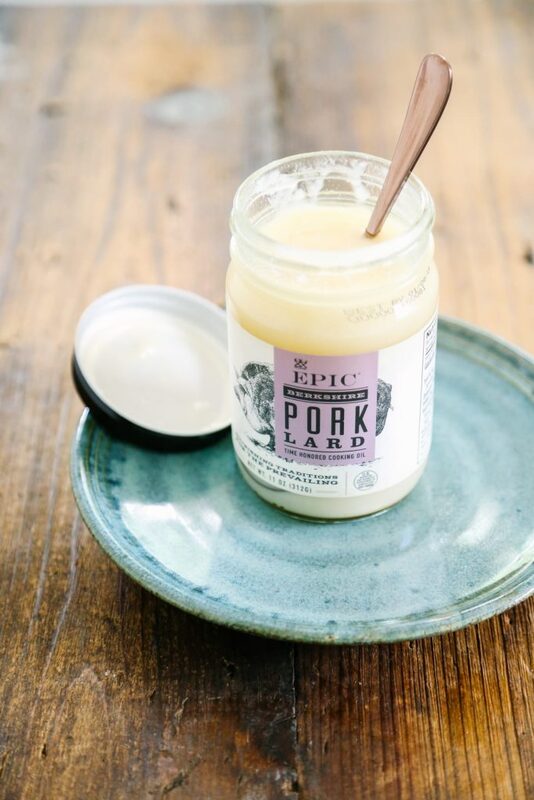 I only recommend using lard from a pastured pig, which means you’ll need to find a local pork farm and make your own, or purchase a trusted brand like Epic (pictured below) or Fatworks. Contrary to modern day advertising propaganda, canola oil is not healthy or real food. Canola oil is made from the rapeseed which in the past was only used for industrial purposes due to a high amount of erucic acid (a heart-damaging acid in rat studies). With a little tweaking and genetic modification the oil was introduced to the public under a new name “canola oil” (formerly known as rapeseed oil). Contrary to the name, this oil does not contain healthy vegetables. Vegetable oil is obtained through the extraction of rapeseed, sunflower, corn, soy, safflower, and others. Vegetable oil is high in Omega-6 which in excess can have significant health consequences. Conventional corn and soy are genetically modified in the US and are major players in the making of this oil, along with chemicals and additives. Vegetable shortening is made with highly processed oils, many of which are genetically modified. Crisco was invented by a candle-maker for burning candles during the Civil War. Food companies replaced vegetable shortening for the more expensive (and real) alternative, lard. Margarine was created to be an inexpensive alternative to butter. Margarine is a man-made butter substitute made with a blend of vegetable oils, along with chemicals and additives. Margarine is basically man’s very poor and unhealthy attempt to replicate something that naturally occurs in nature, cream and then butter. What are your thoughts on grapeseed oil, by the way? Costco sells it in huge bottles and it would be fabulous if it were healthy too! Thanks, Daisy! I’m so glad the info was helpful. I personally avoid grapeseed oil for culinary purposes, because it’s very high omega-6. Here’s a really good breakdown from Dr. Axe about the good and bad of grapeseed oil: http://draxe.com/grapeseed-oil/. Another FANTASTIC post Kristin! You’re awesome! Thank you, Shelby! I’m so glad it was helpful! I remember my grandma always kept a jar of clarified butter on her counter. I made some today thanks to your video and cooked our chicken in it for dinner. Yum. Does the grainy texture go away after 48 hours? Thank you. Hey Bethany, That’s so neat! I love that your grandma kept and used clarified butter! Clarified butter is a bit grainy, and it does remain that way even after it’s fully solid (well, a soft solid). But once it’s solid, it should be more creamy than grainy. Hope that makes sense ;). I know you make so many things but Ghee is one of the simplest things to make and then its much more cost effective. I use 4 packages of kerry gold unsalted butter and then put them over medium heat in a 6 qt stock pot or in my stove top pressure cooker. I let them melt and foam or bubble for about 10-15 minutes then the foam subside and the milk solids will drop to the bottom. Then lastly a second very airy foam will rise and you pull the pan off the heat then and let cool a minute, strain into a jar–I use a fine strainer with several layers of cheese cloth. It makes quite a large jar of ghee and oooh so yummy almost caramely. Its my favorite! Homemade ghee is so delicious. Thank you for sharing, April! Thanks for sharing this great resource, Kristen! I love California Olive Ranch olive oil. They put it on sale… BOGO at Earthfare sometimes, and Big Lots often carries it too. I even found a good price on avocado oil at Big Lots recently which was exciting. I’ve always cooked with coconut oil for higher temperatures, but I’m like you and don’t care for all of my food tasting like coconut. And, I’m so glad you said that the Epic brand lard is a good one. I just saw that Earthfare is carrying that brand so I’ll need to pick up some lard and tallow next time I’m there. Thanks again for posts like these. It’s nice to know about all the different options out there. That’s awesome, Meagan! I love that so many mainstream stores are catching on to these great products. The Epic lard is such a great option. I also noticed that they now have duck fat and tallow, too. I’ve switched from olive oil to avocado oil for most things, and I love it. I just wanted to let everyone know that as of yesterday the Costco’s in New England carry a good sized Avocado Oil (non-gmo, fair trade, etc) for $9.99. Thank you for sharing, Lela! That’s a fantastic price for avocado oil. I’m so glad you’re enjoying avocado oil. I am loving your blog more and more every day! Loved the posting on lard. I grew up in Europe (Croatia & Bosnia) and we cooked with lard all our lives. We kept pigs on a small farm and had the purest lard of them all – no smell, white as snow – no one was ever overweight, I can tell you that. I much appreciate butter (can’t live without) and good old olive oil. Thank you for keeping us so informed. I will most definitely try to make ghee soon!! That’s so neat! Thank you for sharing. I love this so much!!! I love it when people aren’t afraid of fat. I just started doing keto about a month ago and just because of that I made your ghee, so yummy. I put it in my coffee with a little coconut oil and it is perfect! Thank you so much for your blog and your awesome recipes!! This is for Meagan as well. I love seeing post about fat as I believe fat is where it is at, but I was slightly horrified to see you promoting Epic’s lard. As a fat lover I wwill say their fat is burnt and second it is NOT pasture raised, nor is it small batch and handcrafted as they claim on the label and they are blatantly lying about this. If they are willing to lie about this what else do they lie about? I am however very glad you mentioned Fatworks as those guys are the real deal but THEY should be the ones that you have a picture of and are promoting. (I am a BIG Fatworks fan in case you have not guessed 🙂 but I think it’s totally irresponsible to promote the Epic/General Mills brand that is suddenly flooding the market with their rather poorly made oils and marketing them as if they are small batch pasture raised and comparing them to an artisanal company like Fatworks who sources from non gmo small family farms. Fatworks has been trying to get people to learn about fat for years and have done so much to educate people on the benefits of fat. Epic is simply a very poor copy. Also, so you know, Fatworks makes a great leaf lard that doesn’t have porky odor because it’s only from the leaf of the pig and it’s great for baking. Thanks for the rest of the article but I just couldn’t stand by and let the lies continue though. Hey Craig, Thank you for sharing. I’m not aware that Epic has deviated from their original ways. I know they were acquired by General Mills last year, but from what I’ve read nothing else changed and the owners wanted to make sure of that. The acquisition, again from what I’ve read, meant they could have more resources for the start-up company. Can you share sources for your information. I would love to look into this more so I can be more aware of what’s going on with Epic and their practices, since I’m in the dark about the issues raised. Thanks so much for the info. Hey there Kristin. I would suggest emailing them both and seeing what they say. I asked and Epic told me that their Bershire Pork Lard (the one you pictured) is not pasture raised non gmo. It just occured to me that you may be in a tricky spot as you may perhaps receive money from General Mills based on your disclaimer. That is fine if you do, but I just realized that maybe I put you in a bad spot. Sorry if that’s the case. Maybe you will have better luck if you email Epic, but I know several people that have asked Epic where they source and they have all been told that it is more important for them from a money/business point of view to NOT be transparent. It’s hard to imagine that in today’s day and age that they they are refusing to tell where they source. On the flip side, I have emailed Fatworks and they are proud to promote their small family farms. So thanks again for letting people know about them. For me when it comes to meat products I find you always get what you pay for though. But most importantly thanks for letting people know that fat is good. I don’t want to hijack this post though so you can email me directly if you want any more info about this stuff. Thank you! I’ll definitely email them. Oh no, I don’t receive money from them or any company. The recommendations in this post and on the blog are only based on what I’ve used and have loved them. The disclaimer is more for affiliate links for Amazon. I stumbled across your blog while finding a recipe on Pinterest. I completely fell in love with it. So much that, when reading all your recipes, and articles that it finally gave me the “ah ha moment!” What have I been putting in my body!? While reading this article I was disappointed that I couldn’t have all these oils for cooking. I have a tree nut allergy (no fruit that has pits from a tree and coconut). I’ve been using grape seed oil and sunflower oil thinking it was healthy. What would you recommend as a better option? Hey Samantha, Thank you, that’s such a compliment. I’m so glad you’re finding the blog to be helpful! Hmmm, for oils, I’d stick with what you’re using. The most important thing is to listen to your body and what’s working well, especially with food allergies. I’m guessing olive oil is out, too, which is my go-to for most things. 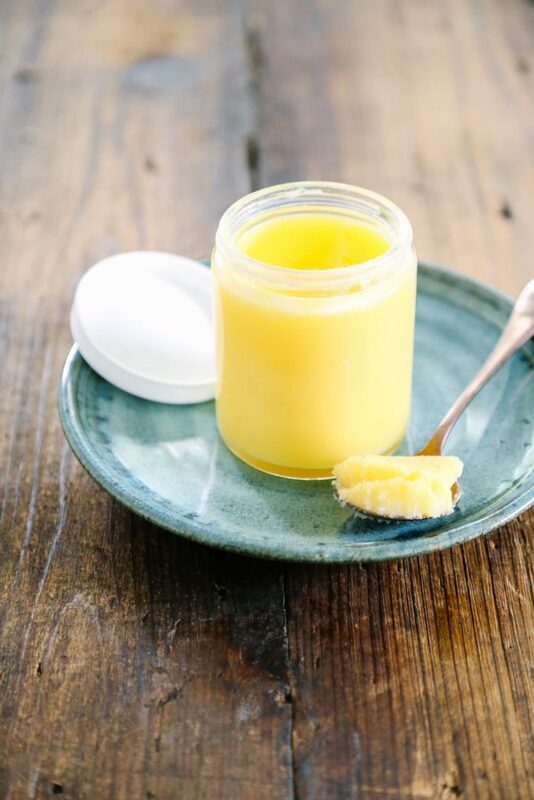 Ghee may be a great alternative, since it can be melted and used an oil alternative for cooking (just not baking or something cold like salad dressings). And sticking with butter for baking.